I have been looking on the web for some time now trying to identify my mothers porcelain that she bought in Germany more than twenty five years ago (give or take a year). It is very thin and has an oriental pattern. It is very detailed and on the inside of every cup is the face of a woman, which can only be seen when the cup is held up to light. There is no ID marking on the bottom of any peace in the set I have. Can you help me find out what kind of porcelain this is? This porcelain is well known and most often called "Geisha" or "Geisha girl" porcelain. It is Japanese and my guess is that it is made at the Arita factory specifically for the Western market during the first decades of the 20th century up until the 1940s. This is so far a guess since I don't have the actual years of production yet. Some sources indicate that porcelain with this mark could have been in production as late as in the 1960s. If the pieces your mother bought in Germany where new when she bought them, we might even be talking 1970s. 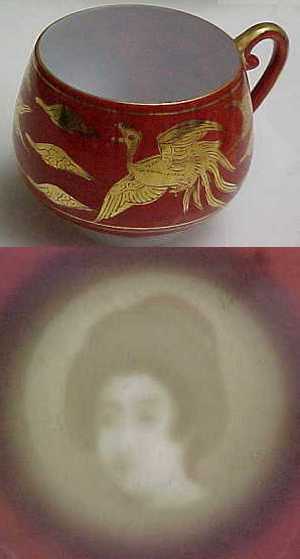 The inspiration for the Japanese "geisha girl" lithophane mark seems more than likely have come to Japan during their early contacts with the West around the turn of the 19th century. All kinds of decorative pieces, probably mostly lanterns was made in this technique in Europe, with its popularity reaching its peak in the 1870s after which point they gradually went out of fashion. Originally, this technique seems to have been developed by the Konigliche Porzellan Manufaktur (KPM) of Berlin in the 1820s and later patented in England, by Robert Griffith Jones in 1828.